VATICAN CITY (CNS) — Marriage is a sacrament not only for the bride and groom, but for the entire Catholic Church, because it proclaims that “love is possible,” Pope Francis said. 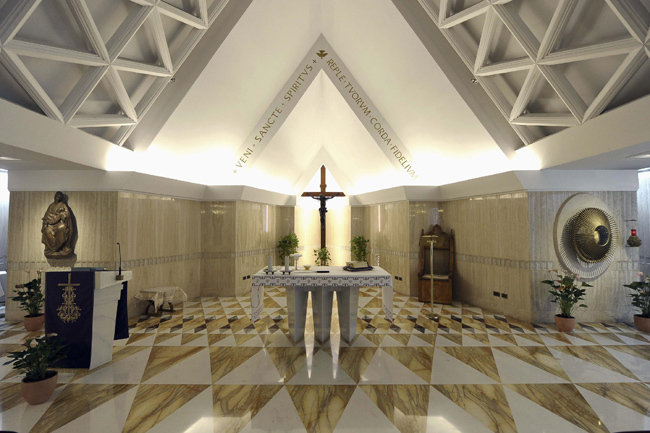 “It is true there are difficulties, there are problems with the children or with the couple themselves — arguments, fights,” he said May 25 at morning Mass in the Domus Sanctae Marthae. Seven couples celebrating their 25th or 50th wedding anniversaries were among those present at the Mass. But the witness of couples who continue in love, who overcome the difficulties, he said, proclaims the beauty of God’s plan for humanity. In the day’s Gospel reading from St. Mark, Jesus is asked by the Pharisees if it is lawful for a husband to divorce his wife. Most members of the crowds who followed Jesus listened to him because they were thirsting for truth and for help in growing in faith, the pope said. But he said the Pharisees were interested only in trying to trip up Jesus by trying to reduce religion to a list of “yes you can” and “no you can’t” items. But Jesus raises the bar, talking about creation and describing “marriage as if it were the most beautiful thing” that God made at the beginning of the world, he said. “Sometimes there is the misfortune that it does not work and it is better they separate to avoid a world war. But that is always a tragedy,” the pope said. So often, he said, people seem to want to talk about separation and divorce, like the Pharisees did, but Jesus’ approach is to talk about the beauty of marriage and how it is a reflection of God’s love for humanity. For the morning Mass, Pope Francis had placed a special reliquary on a small table to the left of the altar. The reliquary holds a cotton ball with the liquid from the famous Weeping Madonna of Syracuse, Sicily. A Rome parish was hosting the reliquary for a special celebration, and Pope Francis had asked that it be brought to the Vatican for a day, reported L’Osservatore Romano, the Vatican newspaper.